Approximately 85 percent of greenhouse gas emissions from the transportation sector are related to the surface transportation system. 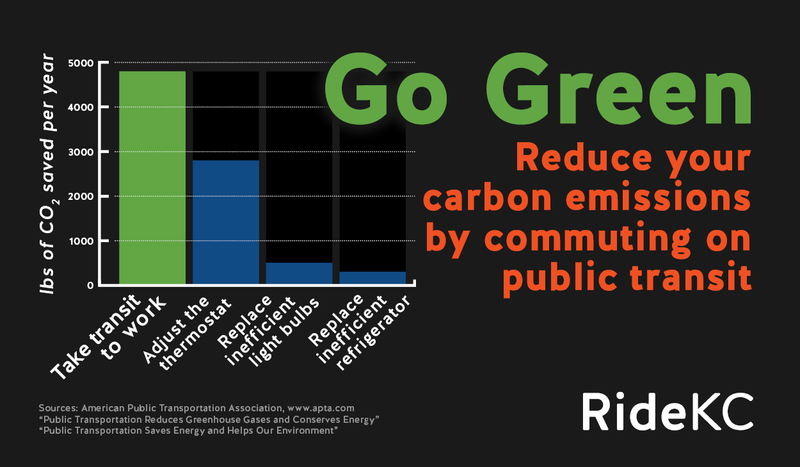 Public transportation use is one of the most effective actions individuals can take to conserve energy. Riding public transportation far exceeds the benefits of other energy-saving household activities, such as using energy-efficient light bulbs, adjusting thermostats, or using energy-efficient appliances. 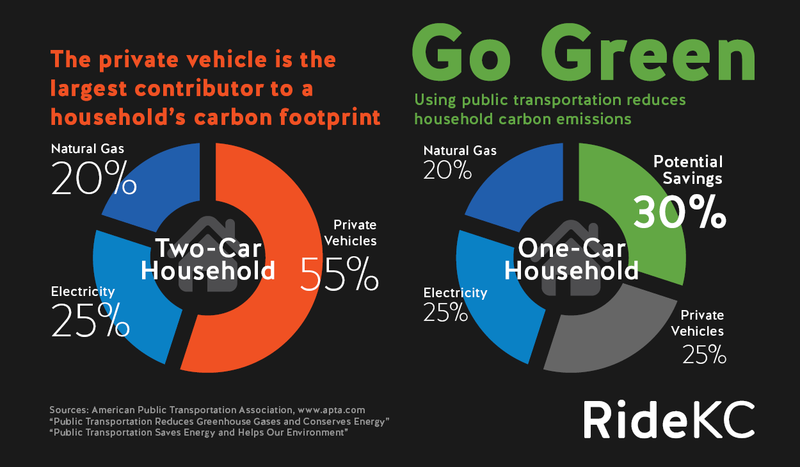 A single person who switches from a 20-mile commuting alone by car to existing public transportation, can reduce their annual CO2 emissions by 20 pounds per day, or more than 48,000 pounds in a year. That is equal to 10% reduction in all greenhouse gases produced by a typical two-adult, two-car household. By eliminating one car and taking public transportation instead of driving, a saving of 30% of carbon dioxide emissions can be realized. U.S. public transportation saves 37 million metric tons of carbon dioxide annually, equivalent to the emissions resulting from the electricity generated for the use of 4.9 million households or every household in Washington DC; New York City; Atlanta; Denver; and Los Angeles combined. Locally, RideKC buses have used the equivalent of 1,000,000 diesel gallon equivalents (DGEs) of compressed natural gas (CNG) since starting to use the fuel in August 2014. The move from diesel to CNG fuel is creating cost savings and environmental benefits. By reaching the milestone of 1,000,000 DGEs of CNG, KCATA reduced its greenhouse gas emissions by 1,870 metric tons. This is the equivalent of taking 395 passenger cars off the road for one year. Public transportation use saves the U.S. the equivalent of 4.2 billion gallons of gasoline annually — and more than 11 million gallons of gasoline per day. Public transportation use saves the equivalent of 300,000 fewer automobile fill- ups every day. The latest research shows that in 2011, U.S. public transportation use saved 865 million hours in travel time. Sources: American Public Transportation Association, “Public Transportation Reduces Greenhouse Gases and Conserves Energy,” “Public Transportation Saves Energy and Helps Our Environment.